CatTimothy House is a small science-fiction press in the dimension of Camestros Felapton. 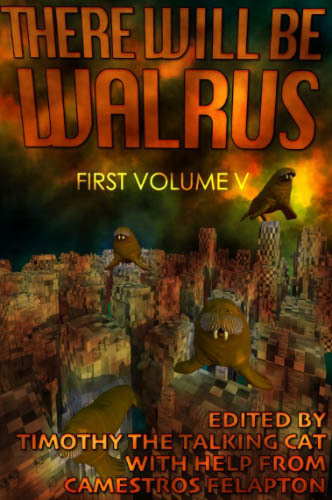 There's no connection to furry fandom - unless you count Pete, the magic walrus. But its website, run by CEO/editor Timothy the Talking Cat, should become better known! From CatTimothy House comes the apex of Military Science Fiction anthologies. Edited by the outspoken and fearless Timothy the Talking Cat, one of America's foremost political philosophers and one of the aspiring leaders of the future, There Will Be Walrus contains stories of adventure and excitement but also insightful essays into the nature of war, politics and the brilliant take-down of the evil presented by squirrels. If you value good old-fashioned science-fiction with actual stories, if you hate squirrels, if you value people speaking the TRUTH to you, then this the book for you.